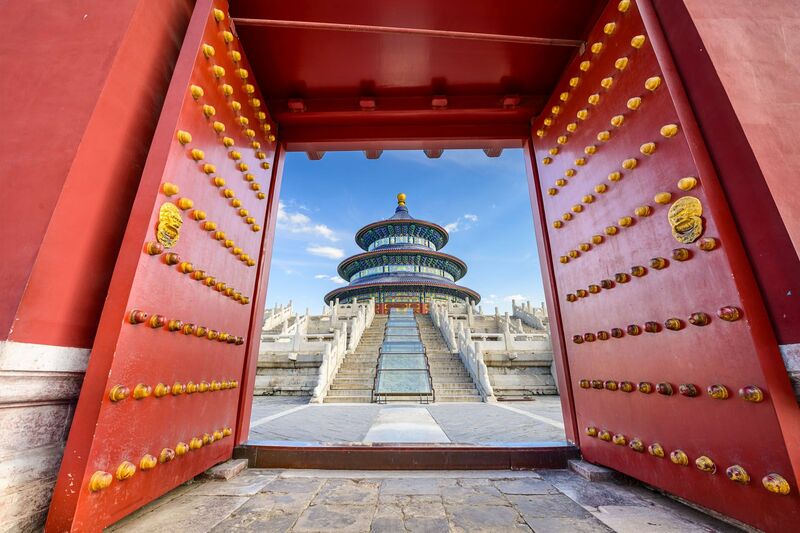 An astonishing capital which is always evolving yet at the same time staying firmly linked to its glorious, notorious past, Beijing is often the first stage of a trip to the 'Middle Kingdom'. The spectacular Forbidden City and the famous Tiananmen Square are unmissable sights within the city walls while allow yourself a whole day to visit a section of the Great Wall. A good place to go is Shanhaiguan in the Hebei Province that surrounds Beijing. Hebei means 'north of the river' (referring to the Yellow River). The region is home to seaside resorts that border the Bohai Sea, Beidaihe being the most well-known because of its imperial tombs. The former summer residence of the Manchu emperors from the beginning of the Qing Dynasty is located nearby to this in the town of Chengde. This magnificent palace housed 24 emperors of the Ming and Qing dynasties (1368-1911), is the best preserved imperial palace in China and the largest ancient palatial structure in the world. The design and the layout of the 870 buildings in the palace represent the essence of traditional Chinese architecture. Tian'anmen Square, just outside the Forbidden City, is the largest public square in the world, and can accommodate a million people. It is where the ceremony for the founding of the People's Republic was held. It is also the most surveilled space in the world with numerous clothed and undercover police patrolling as well as hundreds of CCTV cameras. An unmissible sight, the Great Wall extends 4,000 miles across the width of most of China. Construction of the wall began over 2,000 years ago and took over 1,000 years. There are several Great Wall sections around Beijing that are worth exploring, including restored sections as well as crumbling, overgrown sections which are very authentic. 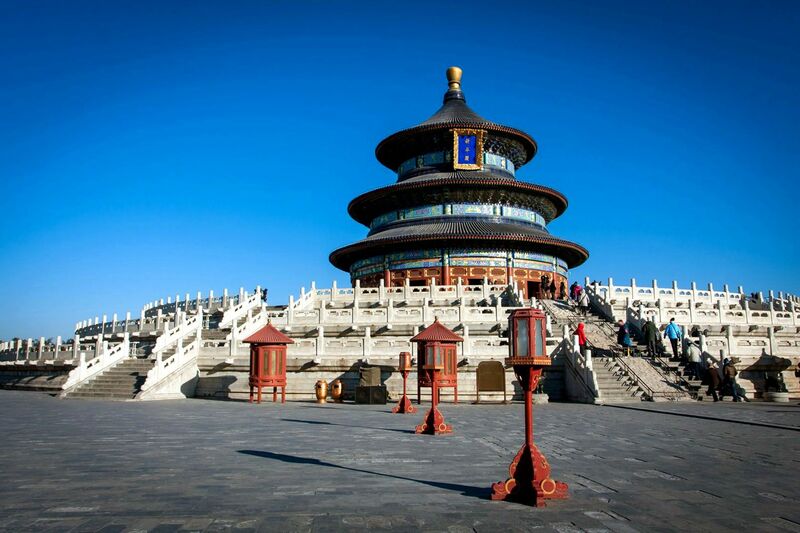 The most famous sections are: Mutianyu, Jinshanling and Jiankou. The Summer Palace is the best-preserved imperial garden in the world, and the largest of its kind still in existence in modern China. It is an exquisite representation of a traditional Chinese garden; come here for a perfect chance to transport yourself back hundreds of years to the time of the ancient Emperors. The Palace provides a charming place to appreciate the artificial landscape of hills, lakes and islands. The Beijing hutongs are mazes of narrow alleyways linking old single-story traditional courtyard houses. Hutongs give a wonderful glimpse into the world of yesterday in Beijing. A visit to a hutong family living in a traditional quadrangle dwelling is a nice way to discover traditional Beijing life. Get lost in this maze and stumble across beautiful oriental fountains and ponds hidden in small courtyards. Jingshan Park is situated to the north of the Forbidden City. On the top of the hill in the park you can enjoy a view of the whole of the Forbidden City. At dawn and dusk you can get stunning photos of the sunrise and sunset over the Imperial Palace and the city respectively. Beijing roast duck is the epitome of Beijing cuisine and one of the most popular Chinese dishes. The dish is mostly prized for the thin, crispy skin, with more authentic versions of the dish serving mostly the skin and little meat. Be prepared to get the ducks head on the plate too! The Beijing authorities regularly advise inhabitants to stay at home due to the high levels of air pollution in the Chinese capital, which is covered in a thick fog of harmful particles. The city suffers from peaks of pollution of unprecedented densities. Many inhabitants wear dust masks when outside, and some even keep them on in their place of work and their homes. Use the high-speed train to get around! The Beijing-Canton line was opened on 26 December 2012 and is the longest in the world, covering 1,425 miles! It also passes through Shijiazhuang, the capital of the Hebei Province. Beware of the 'Grand Tours' of China offered in the brochures. Too many temples visited, transport fatigue and frustration at not being able to stroll around longer at sites are often causes of disappointment. China is a continent and takes time to visit properly, so it's better to limit your plans to one or two provinces - do not be over-ambitious. Find a tour operator specialising in organised visits to the area and follow their advice. For a first trip to China, Beijing and its surroundings are a must. To soak up this mega-city both day and night, give yourself a day to visit each of the essential sites (the Great Wall, the Ming Dynasty Tombs, the Summer Palace...). You'll easily fill up a week without room for a second of boredom! To finish off your trip, visit the town of Chengde, 5 hours by train to the northeast of Beijing. The journey is an experience in itself, and the former summer residence of the 18th century emperors is a true wonder to behold with its palace, its Tibetan-style temples, its park and peaceful lake, all within a magnificent mountain setting. If you don't have time to visit the sanctuaries of Sichuan province, China's largest zoo - Beijing Zoo - is a great alternative. Rated one of the best in the world, Beijing is home to Gu Gu, a naughty male panda who became famous worldwide after attacking zookeepers that entered his pen. China is a country of traditions. The most well-known of all are definitely the very family-orientated festivities of New Year's Day, with the dance of the dragon, marked by loud music and fireworks that are thought to keep away evil spirits. There is also the festivity consisting of burning money (paper notes) or images representing consumer products on the day of the dead to help them have a pleasant stay in the other world. Morning walkers will meet men practicing Taï Chi Chuan (relaxing gymnastics) both on the Shanghai Bund or in the parks of Beijing or Kunming. Old people cultivate their passion for birds, pampered in a cage. Singing competitions are organised all day long. A passion for playing games is also ever-present, from Chinese draughts to mah jong, cards, or billiards disputed on the pavement. With regard to music, although the Beijing Opera is no longer interesting for anyone apart from tourists, the young people, on the other hand, are mad about karaoke (even the smallest towns have their own hall). Western-style dancing is also popular. The pleasure of dancing a fox-trot and a rumba at the foot of the Forbidden City, before office hours, has been unfailing for a dozen years! Amongst the habits and customs of the country, the Chinese population loves exchanging visiting cards on meeting. So you can use yours intentionally. The exchange is made with the two hands. The family name always precedes the first name. Use of the latter is reserved for close members of the family. The Chinese also exchange presents wrapped in bright red paper. Etiquette requires that the receiver does not open it in front of the giver, but later. It is bad form to thank someone profusely. Our advice: if you are inclined to offer a Chinese person a present, never choose a watch. The homonym of this word means 'burial' in Cantonese. Similarly, items that cut (knives, scissors) have a negative meaning, such as the rupture of a friendship, for example. Chinese cuisine is extremely imaginative! Invented by the poor people in the different provinces who were often victims of food shortages, and then adapted for the rich, Chinese dishes are made from every possible and imaginable ingredient. The principal is that everything can be eaten, including any animal or natural product, as long as it is prepared and cooked to make food that will alleviate hunger, and is presentable enough to be served to an important person, even the emperor himself...Food is so important in China that "paole ma?" (a way of saying "hello"), means "are you full?". As a general rule, the cuisine in the north, a region that is very cold in winter, is wheat-based, hence the noodles and steamed bread rolls rather than rice. Chinese cabbage is the vegetable par excellence. The great speciality is Peking duck. It is cooked in its skin that is made watertight using a type of varnish. This famous dish, which should be ordered in advance if it's for a number of people, is cut into slices and served in small crepes accompanied by various sauces. People eat with chopsticks (kuaizi means fast) and drink tea (yellow or red), and particularly beer, all over China. Soup (a light stock) is served at the end of the meal to facilitate digestion. People eat a lot of noodles and particularly tiaozes (delicious ravioli fried with vegetables) on a daily basis. Dessert is not compulsory. Be aware that local restaurants close at 8:00pm, and the restaurants in large hotels are not necessarily the best places to eat authentic cuisine, despite the prices. However, the food is generally fresh and of a high quality. Each region has its own specialities, and there is certainly no shortage of ideas for authentic artisanal gifts. Traditional costumes, silk garments, fur hats, objects or seals carved from soft stone, cloisonné, confectionery...You'll be spoilt for choice. The Friendship stores are real show rooms for Chinese products, previously reserved for foreigners and officials. The one in Beijing (17, Jianguomenwai Dajie) is the largest in the country. It's a very practical place to get all your last minute purchases in one go. However, the prices are sometimes higher and the staff rarely smile. Other than Baihuo Dalou, China's largest department store, only a few old shops remain in the famous Wangfujing Street, Beijing's most commercial street, just a stone's throw from the hotel of the same name. Wangfujing Street (meaning 'the well of a princely residence') has lost some of its charm since the high ultramodern blocks of flats and luxury hotels were built on it. Liulichang, the old antique dealers' district, has been entirely rebuilt for tourism, but is still worth seeing. The shops sell calligraphy material and quality antiques, but watch out for replicas. General information: you are not allowed to export items over a hundred years old (you have to provide certificates to customs services and the prices for these are sometimes exorbitant). Just south of the Qianmen Gate is Dashila, a popular and very lively district full of all sorts of shops from DIY, electronics and lighters to clothing and shoes. Don't miss the famous Chinese pharmacy, Tongrentang, where consultations and herbal remedies, made from ingredients such as stag antlers, are available. Xidan Market, near the popular commercial Chang'An Jie district, hosts a clothes market every evening that's worth visiting. To the north of Ritan Park, the Chaowai Market sells furniture and small items. The Shichahai Market, near Beihai Park, is similar. Another one to see is the Hongqiaoshichang or Pearl Market, a covered market near the Temple of Heaven. An 'Old Chinese' atmosphere and modern knick-knacks guaranteed! To discover the most authentic of the flea markets, Panjiayuan, you have to go to the southern district of Jinsong on Saturday or Sunday. You'll notice that there are just as many 'made in China items here as in the UK!